Honey, aside from being a tasty snack, can be used for a variety of home and health-related applications. Honey is one of nature’s purest foods for promoting general health. There are so many health benefits to honey; it truly is nature’s super food. Raw honey contains 27 minerals, 22 amino acids and 5,000 live enzymes. It keeps you healthy by fighting disease and boosting the digestive system. One daily spoonful in your tea or spread on your toast is all that is needed to reap these benefits. Even the Bible tells you to eat honey! Honey is great for cuts and wounds – Honey has been used to treat wounds for thousands of years. The antiseptic properties of honey will clean wounds and inhibit bacterial growth. Its natural antibiotic and antibacterial properties aid in treating cuts and burns. 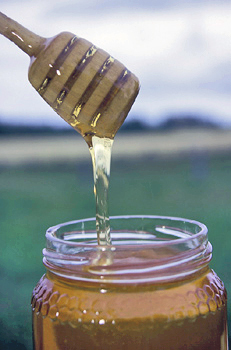 Honey can be a beneficial additive to your diet – Unlike refined sugar, honey contains vitamins and minerals. Refined sugars are void of vitamins and minerals. The body must utilize its store of valuable nutrients to digest refined sugar. This process depletes the supply of minerals essential to dissolve cholesterol and fats. Honey helps metabolize cholesterol and fatty acid preventing obesity.